As my time in DC comes to a close, I'm reflecting on all the amazing adventures I've gotten to experience this summer. I had the ability to become a long-term tourist in DC, which has granted me so many terrific opportunities: beautiful morning runs through all the monuments; exploring the many museums; watching Ferris Bueller’s Day Off at Lafayette Park; cheering on the Washington Nationals; and playing kickball on the Mall with my fellow classmates. I feel grateful to have been exposed to the unique aspects of DC through the facilitation of my college. My university connected me to DC-based alumni, set up tours of facilities like Lockheed Martin, and organized a variety of professionals to give advice during nightly seminars. This summer has flown by, and I could not imagine a better way to spend it. Anyone who has the ability to participate in something similar to this should do it! 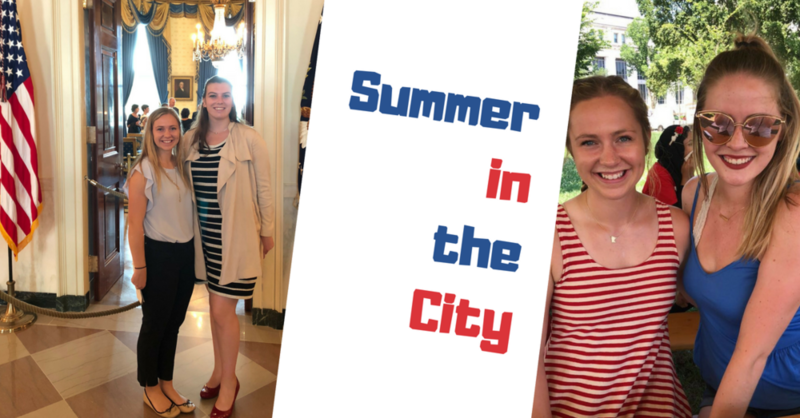 Even though I knew before landing in DC that I would have an amazing time exploring the area and meeting new people, I was not completely sure on how my internship was going to pan out. I was nervous about meeting the Children’s Cause for Cancer Advocacy’s staff and whether or not they were going to have anything for me to work on. I learned pretty quickly though that at a small nonprofit (CCCA only has 2 full-time staff! ), there are always items that can be worked on, which has made this internship energizing and engaging. Some highlights from this summer as an intern for Children’s Cause for Cancer Advocacy include: drafting letters and requests to various agencies; researching programs with untapped potential such as Passport for Care; experiencing what it's like to lobby members of Congress on the Hill; and learning to plan fundraising events like Jazz in June. These projects have helped me gained not only a unique perspective of the pediatric oncology field, but they've also helped me improve my writing and communications skills and even taught me to love Excel (Thanks, Charlcie!). I might be biased when I say this, but I believe I had the best internship experience out of everyone in my school. I could not be happier about how my summer has panned out and all the people I met along the way. I am sad my time is coming to an end, but I cannot wait to hear about the updates all the way back in Minnesota! Thank you to all of you at Children’s Cause for Cancer Advocacy! For Nicole and everyone else, the best ways to follow along with us regularly are Facebook and Twitter. Be sure you're following us! We thank Nicole for her hard work and dedication all summer. She was a delight and we will miss her!